Fitz Like A Glove™ Cover Package. One Click. One Payment. / The Fitz Like A Glove™ Ironing Board Cover Package #1. Cover + Superior Felt Underlay + BBPC. One Click. One Payment. The Fitz Like A Glove™ Ironing Board Cover Package #1. Cover + Superior Felt Underlay + BBPC. One Click. One Payment. Standard Size, Buttercup Golden Not Pale. Standard Size, Warm Mid-Grey. Standard Size, Cloud White. Standard Size. Driftwood. Standard Size, Ebony. Standard Size, French Blue. Standard Size, Lush Myrtle Green. Gumleaf. Standard Size. SOLD OUT. Has been discontinued by my fabric supplier. Standard Size, Rich Dark Chocolate. Champagne. Standard Size. A few left. Has been discontinued by my fabric supplier. Extra Small, Buttercup Golden Not Pale. Extra Small, Champagne. Extra Small, Cloud White. Extra Small, Driftwood. Extra Small, Ebony. Extra Small, French Blue. Extra Small, Gumleaf. Extra Small, Rich Dark Chocolate. Buy the Standard Size or Extra Small Fitz Like A Glove Cover + Superior Felt Underlay + Best Boy Pressing Cloth. One click. One payment. For size range, see Features. All prices are in Australian dollars (AUD). And for our international customers, we debit your credit card in Australian dollars. In addition to the invoice you receive when you place your order online, I issue my own inhouse Tax Invoices that are included with every parcel. For Australian customers, my Tax Invoices are compliant with the ATO and their requirements for the GST. Your Fitz Like A Glove™ Cover comes with a 12 month replacement guarantee for faulty workmanship. As well as. Wear and tear. You also have to love it. Or send it back. Returns are at our expense. And we refund your full purchase price, including postage and handling. We've had two covers returned since 1994, so this is not a big issue with us. Postage and handling within Australia is a flat rate PER PARCEL Australia wide, regardless of how many items you put in your parcel. The current flat rate per parcel is AUD$16.00. Postage and handling outside Australia varies from country to country and is based on the weight of each parcel. Break points are 0.5 kg; 1.0 kg; 1.5 kg; 2.0 kg; 2.5 kg; 3.0 kg. 3kg is the maximum per international parcel. Prices are based on Australia Post's current international charges. For international customers, please check with your respective Customs agency to see if any import taxes or duty will be applied to your purchase. If they are applicable, these charges are made at the time of entry into your country. And are payable by you. Australia has Free Trade Agreements with many countries. But not with all countries. Your parcel must be signed for, so if it's more convenient, please use your business/work address. The Fitz Like A Glove™ Cover is made of 100% cotton drill so it's machine washable. The fabric has the standard 3% shrinkage rate if washed in hot water, so we always recommend you wash it in cold water only. Don't worry about colours. All colours have been tested colourfast to trim fast stage. Meaning. We've tested each colour in boiling water. And if the water is clear after 10 minutes, we then take the wet swatch out and rub it with a pristine clean white cloth. If no colour rubs out onto the cloth, it's completely colourfast. Wedding gown makers trust our colours. As do professional ironers. Dressmakers. And fashion designers. Do not tumble dry because it will shrink from the heat of a clothes dryer. It dries best out of the sun. Hanging on a hook in your laundry room. Wash it as frequently as you like. A professional ironer will wash their cover every day. A domestic ironer should wash it at least 4 times a year to refresh the fibres and give your cover added life. If you are a heavy user of spray starch, you should wash it once a week to rid the fabric of the sizing that's in spray starch. 33cm W x 111cm L to as large as 46cm W x 140cm L.
(Inches = 13.2" x 44.4") to (Inches = 18" x 56"). The Extra Small fits smaller board sizes from 29cm W x 85cm L to as large as 32cm W x 110cm L.
(Inches = 11½" W x 34" L) to as large as (Inches = 12¾" W x 34" L). It comes complete with graphic fitting instructions. Including how to trim the Superior Felt Underlay. And how to reuse the pocket. The pocket it's packed in is reusable. Hang it under your board on one of the hooks and fill it with a clothes brush. Spray water bottle. Iron cleaner. Or perhaps a bottle of wine to sip as you iron and watch the football or listen to Maria Callas. The Superior Felt Underlay is a rectangle 46cmW x 137cmL. It's layers of polyester needled together to create a firm blanket almost 1cm thick. When you're ironing, your hot iron heats up the metal mesh of your board. Which, if not protected, will burn your cover. And your garments. 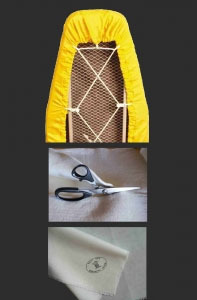 Trim the Superior Felt Underlay with a pair of kitchen scissors to cover not only the top of your board. But to go down the sides as well. The Best Boy Pressing Cloth is all natural, 100% seeded homespun. Robust enough to absorb the heat but light enough to see the shape of your garment. The size is 25cm x 75cm (10"x 30"). It's ideal for pressing ties, trousers, scarves, woollens and T-Shirts. The finish is hand frayed around all the edges so there's no seam or hem to mark your clothes, or lint to mess up your finished garment. The attention to detail includes a stylish laundry proof logo that lets you know to always iron on that side so the side in contact with your clothes stays clean. Safe to use. All natural. Not chemically treated.